I ate lunch with clients at a gorgeous French restaurant. The setting was rolling countryside. The three-course meal came complete with a cheese trolley, encyclopedic wine list and a lovingly-christened dog called Cassoulet. Back in London I had just about enough time to rush to Covent Garden for dinner with the girls. Formerly journalism students, we all saw the error of our ways. Moved into PR. And regretted it ever since. We tucked into another three courses and complimentary Bellinis at a low lit Covent Garden bistro. One German, a Kenyan, a Spaniard and me. The food was standard Brasserie fare. The conversation low brow to match – clients, classmates and copulation. Sometimes it’s the simplest things that complete a meal. Like Papad. These wafer thin discs of lentil crisps are the perfect accompaniment to any Indian meal. You can dry roast them on a naked flame. Or fry them in hot oil. That’s a choice of too much effort or too much effort. So I don’t bother with either. 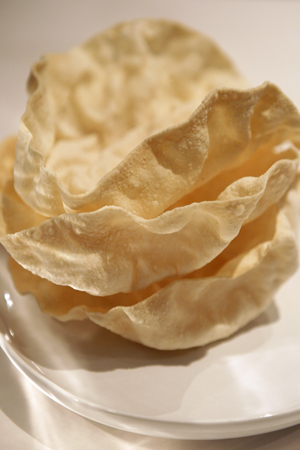 How to cook perfect pappadom (Papad) easily? I just stick them one at a time in the microwave for a minute each. They curl up slowly, turning crisp and golden in places. I’ve tried this technique with the perennial classic spicy Lijjat Padad and Khanum Madras Plain Pappadom. And it works every time. Glad I’m not the only one who does them in the microwave! for how long do u let it cook in the microwave? I agree conversations with friends over a meal is the best times in life. Those Papad look gorgeous! All time favorite snack of ours! Lovely reading… gorgeous mom of a gorgeous daughter! I am quite like you – although I got inspired by my ma, dida… I cook like no one else – I have learnt to cook only after getting married and S and I started setting up our home, far away from the shores of Bengal. We used to crave for traditional dishes which as a child we used to avoid – korola bhaja, shukto, chyachra, patla maacher jhaal etc. What interesting reading! That’s such a nice smiley pic of your Mum. 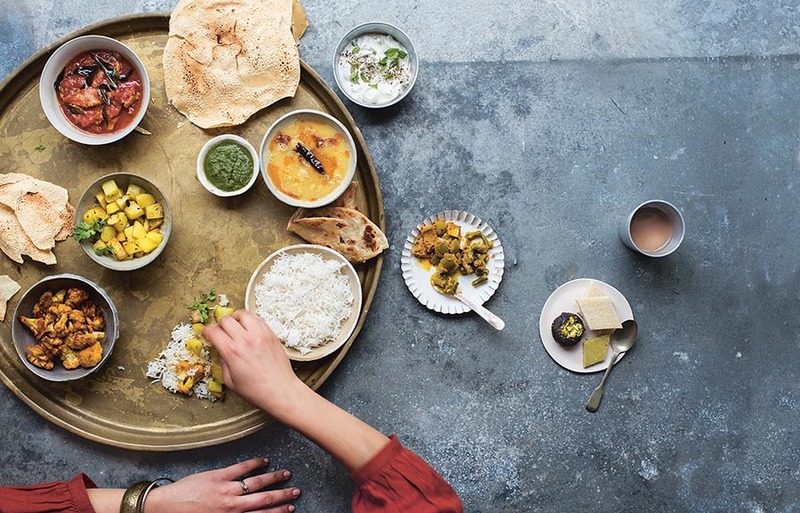 I love cooking Indian food and because I am not blessed with any connection to the Indian subcontinent, bought quite a few cookbooks. I learnt to cook thanks to cookery writers like MJ and yourself. My family always request your Murgh Makhani and we have made the Seekh Kebabs and loved your story about the Outback barbecue! I suddenly who you are….this is truly one of those OMG moments….ur mother’s quite the celebrity…and of course u r the from the Basu clan….am in utter shock…btw am in instagram as dasshaoli…ardent follower for last 7 yrs but writing to u for the first time…. I can’t actually remember my mother teaching me anything. But I did a lot of cooking while I was growing up. American style Norwegian Lefse, for example. Bacon and eggs with pancakes out in Big Sur in California. Chocolate pudding made with cornstarch and milk! Those were the kind of dishes I made between the ages of 10 and 16 or so. But now I’m absolutely mad about Indian cuisine. And I am studying and studying and learning and learning and reading and reading to learn more about Indian cooking. I just love it! Although it is still a mystery and challenge in many ways! My family was rather adamant about not letting its kids cook, grandparents downward. The women in the generation above me learnt out of necessity, when they moved abroad and had to fend for themselves. It was seen as a life skill that could be acquired when it was needed. In a lull in my academics, between MA, job applications, entrance/competitive exams and M Phil, I got bored and started baking despite severe protests. Never cooked regular food, only fancy stuff like souffles, puddings and rum babas, with an old oven lying around the house. Of course, once I made it, my folks would try it out and say Nice but also cluck that I could do better (academic, professional) things with my time. The grandparents, now gone, probably would not like it that I have a food blog but at the same time I am pretty sure they would be proud, amidst all the clucking. My parents are – very! I learnt regular cooking only after I got married. Cookbooks, The Spouse, and my mother, who’s not a cook herself but manages fine when necessary, would explain on the phone if I had questions. Cooking with my mother when I was living at home was mostly stirring the gravy, while she did all the other (and more interesting) tasks….though I admit, she taught me to peel veggies and make French toast, both of which have been useful skills. She was a great cook but she had so many other interests in life that the kitchen was not our prime focus together, other than when we were engaged in nightly dishwashing and cleanup. The real cooking, I learned from my first spouse. He had left home earlier than me so had been feeding himself (rather well) for a couple of years before we got together. It seemed like he could tackle any type of food without fear. But on the rare occasions when there was something neither of us knew how to do, I’d call my older sister-in-law, who was a genius in the kitchen department, and she’d walk me through the process over the phone. I remember doing that once – the first time I ever had to cook a turkey, with guests coming for dinner. My significant other was supposed to make the dinner but he got held up working late so I had to take over. My sister-in-law was wonderful! Cooking with my mother when I was living at home was mostly stirring the gravy, while she did all the other (and more interesting) tasks….though I admit, she taught me to peel veggies and make French toast, both of which have been useful skills. She was a great cook but she had so many other interests in life that the kitchen was not our prime focus together, other than when we were engaged in nightly dishwashing and cleanup. The real cooking, I learned from my first spouse. He had left home earlier than me so had been feeding himself (rather well) for a couple of years before we got together. It seemed like he could tackle any type of food without fear. But on the rare occasions when there was something neither of us knew how to do, I’d call my older sister-in-law, who was a genius in the kitchen department, and she’d walk me through the process over the phone. I remember doing that once – the first time I ever had to cook a turkey, with guests coming for dinner. My significant other was supposed to make the dinner but he got held up working late so I had to take over. I knew how to stir gravy, but not how to actually make the gravy, or much of anything else that preceded that step. My sister-in-law was a wonderful coach and the dinner was a success! Fabulous blog. You nailed it on the head for all of us growing up in big cities in India with mothers who looked over their glasses whilst reading the morning paper at the cook, to make the final decision about the days menu for the family ( dad’s hypertension- related dietary needs and sisters aversion for some vegetable or other included). I learnt to cook out of sheer desperation for ‘ghar ka khana’ when I came to the UK. My gratitude to the cooks of my childhood who tolerated me hanging about the kitchen asking them about their life whilst making nails and baskets out of chapatti dough . I’m sure I subconsciously learnt something from them when I started to make messes in my own kitchen. I am a newcomer to your blog. Wonderful post and it really made me thinking! I never cooked with my mother much, before I actually started cooking. In fact, just enjoyed eating them. But after marriage, I did ask her for the typical South Indian recipes. But cooking has always been my style, with the way I do. I did have a few downs during my initial cooking days, but it made me a better cook. I’ve been using the Papadum Express for a while now and its the best quality papads I’ve had in a long while. My sister in Malaysia had this gadget and it really got my eye and my husband bought it as soon as we got back to the UK and we’ve never looked back since. Its a fairly simple and easy process now. No oil in papads is what i always wanted for my kids and husband and now I have it. give it a shot, you’ll appreciate the quality of the product too. I am from New Zealand and we all use the Aussie made Papadum Express for microwave papadums only. Never cook them in any other way!? That’s all we know. Papadums and microwaves. My husband is a bigger fan of these than the kids too. Malika, I read your blog review on the Papadum Express and wanted to buy one in India. Is this an Indian product? I have searched Amazon for Papadum Express and cannot find it? Have you a link to pass on to us here.